Adler was born in Queens, New York. A year after Adler was born, his family relocated to Scottsdale, Arizona where he grew up. He attended Horizon High School, and immediately after graduation, he moved to Los Angeles to pursue an acting career. After various roles in a number of productions, Adler was cast in a minor day player role in the Fox television series Glee as school jock and bully Dave Karofsky. Glee creator Ryan Murphy was impressed with his performance and started to write more for him. 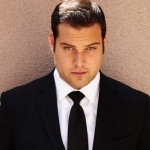 In the November 2010 episode "Never Been Kissed", written to tackle the issue of LGBT youth bullying, Karofsky is revealed to be a closeted gay teen. He received positive responses via the social networking websites Twitter and Facebook, and commented that he was "honored to represent such a large group of people". The character eventually gives up his bullying and makes his peace with Kurt, but he remains closeted. Adler has been praised for his performance in the season three episode, "On My Way", during which after his character is outed, he attempts suicide. After wrapping on Glee, Adler was immediately cast in the Shawn Ryan action drama pilot “Last Resort” for ABC which was filmed in Hawaii. Since then, he has completed work on several exciting independent films that have shot all over the nation. One of which was a starring role in “23 Blast,” a film about a football player suddenly stricken with irreversible blindness. The film was directed by the veteran actor Dylan Baker, and Adler co-starred with Stephen Lang of Avatar and Alexa Vega. Most recently, he completed work on “Believe Me,” a comedy that Adler stars in alongside Alex Russell of Chronicle, Zachary Knighton of Happy Endings, and Christopher McDonald. Also, he just wrapped a family drama/ comedy called “Saugatuck Cures,” in which Adler plays the lead role. He is now a major recurring role on the hit, award winning ABC Family show “Switched at Birth,” and his episodes will return airing June 16, 2014. Adler is also heavily involved with activism. Following the Glee episode "Never Been Kissed", Adler was contacted by the It Gets Better Project, an internet based project founded by Dan Savage and his husband, Terry Miller, which aims to prevent suicide among LGBT youth. Adler recorded a heartfelt video for the project, offering words of hope and encouragement for kids and teens facing bullying due to their sexual orientation. On November 15, 2010, Adler spoke at the Anti-Defamation League’s Concert Against Hate at the Kennedy Center in Washington, D.C. Adler has also worked closely with the Muscular Dystrophy Association to help raise awareness of the hereditary muscle diseases. Adler's mother and grandmother have both passed from Facioscapulohumeral muscular dystrophy, also known as FSH or FSHD.